Some folk cynically say that although you may think you have met the absolutely perfect partner, it's only because you haven't moved in with them yet. Connacht's squad have just returned from spending 14 days and nights in the company of each other but, more importantly, their third coach in three seasons, Andy Friend. It's fair to say they know each other quite well at this stage. 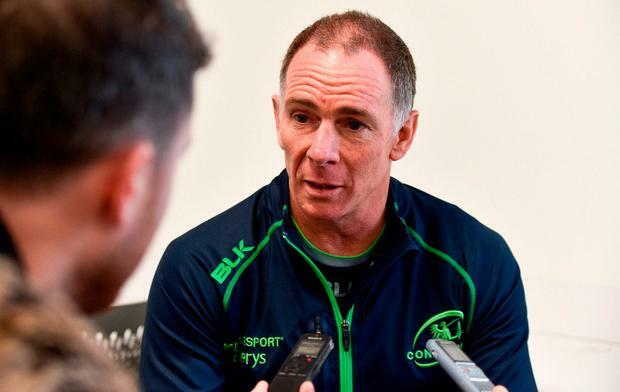 For two seasons now, Connacht have been rolling inevitably towards the sporting equivalent of divorce; this year's model seems like the perfect marriage. The fuel for such a strong relationship, namely results - and the performances that create them - help, of course. Navigating the potentially diverting South African safari with a handsome nine-point haul has maintained their target of a Guinness PRO14 play-off place. And, as they eye a December double against Perpignan which, on paper at least, seems eminently capable of producing another couple of wins, the club can contemplate the festive interpros with a renewed commitment to course success on two fronts. The Australian, whose side welcome the basement Top 14 side to the Sportsground this Saturday (KO, 3.15), asked whether the Challenge Cup might now take precedence, issued a cheeky reply which reflects slowly simmering confidence out west. "I'm not sure to be honest with you," he begins. "We want to be proud of every performance and be better. You can see that. We haven't clicked yet. But you can see it building. "But it is in Europe now after the PRO14 and we want to be reflecting on a good win and looking at areas that did well. Is Europe more important? I want to win both mate! "We're three from three now. If we get to four things are looking pretty good and it is a good feeling to have no matter who you play or where. It's about our performance. "We'll know where we are after these two, if it is still alive or whether it is dead and then we need to re-focus again. "So it is an important week for the team and for certain players. We are building depth and it's another great opportunity to see that depth." That depth chart will be heightened by a slew of internationals returning to the fold - Finlay Bealham, Quinn Roux and Bundee Aki, who had been due to get married - all named by the coach. "There's every chance Bundee will play. He was really keen to come over on tour but we had Kyle Godwin and Tom Farrell who were doing very well. "He has got his wedding coming up. He wants to contribute and put in so there is every chance we will look to get him out this weekend." And there will also be opportunities for Eoghan Masterson and Dave Heffernan to gauge their fitness for festive battles ahead as they headline the acts returning from casualty. Niyi Adeolokun will, sadly, be marked absent; after taking a heavy knock on his arm in South Africa, surgery beckons for the exciting winger who had been displaying good form of late. "I feel like we are starting to get that internal competition where blokes are really pushing each other," adds Friend. "When you get that you start to get quality performances and depth. Touch wood, we can avoid injuries. "And if we can keep the squad as it currently is and start to get some players back, why can't we challenge for both?"